The best electric smokers are so easy to use that even beginners can use them as soon as they read the instructions manual! 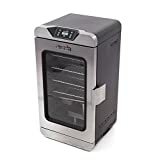 These also provide numerous benefits over other types of meat smokers, especially charcoal and propane smokers, such as the ease of cleaning, the electronic controls for time and temperature, and the affordable source of power. Indeed, these electric meat smokers make the process easier and faster, a convenient aspect for people who are too busy to make regular checks on the poultry, pork, or beef. 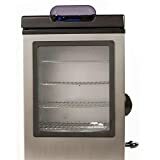 Thereby, we discuss the features that make the following electric smokers for sale the best in 2019. When choosing from among these recommended products, we suggest taking into account your specific needs and wants in it. The Smoke Hollow electric meat smoker is among the most advanced of its kind, partly thanks to its Bluetooth technology feature. But it’s just the icing on the cake as it has many more convenient features that make it among the best in its niche. The mobile app, which can be downloaded to your smartphone or tablet, makes it easy to control the smoker’s time and temperature from a certain distance; many users say it’s limited in range but it definitely beats making the manual adjustments. Beyond the Bluetooth convenience, the main and probe thermometers are accurate – and it’s definitely more important in smoking meats. The dedicated heating element is among the spot-on ones in the market, too. The cold smoking setting is yet another good feature since it can be used for smoking a wide variety of cheese and fish without making them too soft or too crisp (i.e., overcooking). There’s even a fast smoke setting where the wood chips, which are used for flavoring the meats, can be automatically set on fire within 15 minutes (i.e., no waiting period for the user). Yet another highly satisfactory Smoke Hollow electric smoker is the 30162EW that has been designed by smokers for smokers, so to speak. Such is its versatility that it can be used for smoking meats of many kinds. The electric smoker is well-built from its cabinet to its racks and heating element. Many users say that it’s among the most durable of its kind so much so that it can withstand hundreds of hours of use. The double-walled cabinet combined with the 1,500-watt heating element means the desired smoking temperatures can be reached quickly. The former keeps the heat in while also contributing to even heat distribution, a must for even cooking and flavoring of the meats or fishes in the unit. The latter can also be adjusted so that temperatures as high as 220° t0 240°F can be achieved. The wood chip box can be filled with the desired wood chips, such as hickory, for added flavor. Be sure to fill the water pan with water for best results. There are three cooking grids for a relatively large capacity. The digital controls in the Bradley 6-rack smoker make it easy-peasy to use even for a newbie in the art and science of smoking. The user interface is also intuitive so there’s only a low learning curve required. The electric smoker has six cooking racks that can smoke several kilos of your choice in meats, such as pork, beef, and chicken, and fish. The dimensions are large enough for it but small enough to be placed even in a relatively small outdoor area. This is a fairly heavy smoker so it should be placed in a permanent position, if possible, but it’s also the reason for its strong and stable quality. As a digital smoker, it features a fully controllable time, temperature and smoke levels so there’s no second-guessing yourself. Plus, it can also be used for roasting and barbecuing meats, vegetables, and even cheeses! This is possible due to the separate burners, internal thermostat, and large cooking space. Many of the products in this list are Masterbuilt electric smokers for good reasons. The manufacturer is well-known among connoisseurs for the durable construction, reliable performance, and versatile uses of its electric smokers. There’s also the fact that most of its smokers have larger cooking areas than many smokers; the Masterbuilt smokers can accommodate as many as 6 whole chickens, 2 whole turkeys, and 8 racks of ribs, among others. The 30-inch smoker has compact dimensions that make it suitable for use in homes and restaurants with medium-sized smoking needs. There’s minimum user interference necessary – just plug it into an electrical outlet, set the time and temperature using the digital controls, and leave it to do its work. You may have to check on the cooking progress once in a while but that’s all there is to it. The fully-insulated body means even heating that, when combined with the integrated thermostat control, means consistent temperature, too. The meats being smoked should then come out perfect, from their fall-off-the-bone quality to their delicious-to-the-bone flavors. The Masterbuilt brand of electric smokers is known for the attention to detail that makes the products a joy to use. The 20072115 smoker certainly fits the bill, from its overall construction to its doors, lights, and chip loading system (i.e., details). This is also a Bluetooth-enabled electric smoker with a downloadable mobile app. From it, you can actually control its power on/off switch, set and monitor the settings for time and temperature, and even operate the food light! Talk about taking the traditional art of smoking meats and fish to the digital level and succeeding at it, too. Aside from its large cooking area, a common feature in Masterbuilt electric smokers that can accommodate as much as 80 pounds of food, it also has several convenient features. These include the side loading system for the wood chips, the built-in probe thermometer and integrated thermostat, and the LED lights, all of which are crucial in getting the right results. The cabinet itself is made of stainless steel so that even heating of the meats can be achieved. Don’t dismiss the analog electric smokers like the Masterbuilt 20070210 because it has its merits, too. Keep in mind that the most important things in the best electric smokers lie in three things, namely, their fast and even heating capacity, strong and stable build, and safe design. Many users say that it’s built like a robust tank, in a manner of speaking, especially with its stainless steel body and traditional latch. This is an important design aspect since smokers should be able to withstand hundreds of hours of cooking time and pounds of food. The dual-wall metal design ensures that the heat stays within its body while the 1,500-watt heating element generates even and constant heat during the entire duration. The result: The meats are cooked evenly on all sides and straight to their core without being dry and crisp; be sure to set the right temperature for this purpose, nonetheless. The variable thermostat temperature control and built-in thermometer are there for it, too. Due to the more affordable cost of electricity, smoking meats and fish become more economical in comparison with wood, charcoal, and propane smokers. The Char-Broil Deluxe electric smoker has a large-capacity smoke box so its smoke can last between 4 and 7 hours; no refills are needed for smoking even the thickest of meats. This is used in many restaurants, too, because it has a fairly large capacity with 4 adjustable cooking racks and 725 square inches of cooking area. The beauty of this smoker also lies in its accurate integrated meat probe, a removable and washable part crucial in determining whether the meat is already cooked on the inside. Just insert it into the meat and get the internal temperature reading from which you can determine whether the food still needs more time cooking or not. Once it’s cooked, you can keep it warm inside the unit until it’s ready to be served. The double-walled construction means that the heat and smoke can be locked inside the unit so it can produce faster results – and the faster the cooking time, the lower the energy consumption. The control panel allows for simple adjustments which can be made even in dim conditions due to the bright LED display. 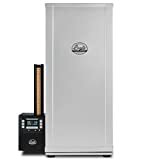 If you’re looking for a digital smoker with a high heating capacity and long smoking capacity, then the Bradley smoker is among your best choices. Aside from providing up to 8 hours of cool smoke, it can also deliver on up to 320°F of heat – and it’s quite wonderful if you’re smoking larger slabs of meat. Many control freaks will like the Bradley smoker because if allows for near-total control of the smoking process, from the duration and amount of smoke desired to the period and heat needed for the food items being smoked. Due to its adjustable time and temperature aspects, it can also be used for other non-smoking purposes, such as for roasting and barbecuing meats, fish, and even vegetables. There’s even the convenience of automatic feeding of Bisquettes into the burner approximately every 20 minutes. You can just leave the smoker and attend to your other businesses for as long as the correct amount of Bbisquettes have been loaded. The 500-watt cooking element may not be as powerful as the other smokers here but the results are still the same. While Masterbuilt electric smokers work well, if not excellently, on their own, the use of accessories is recommended since these can expand their uses and enhance their functionality. Such is the case with this cold smoking kit, a compatible product with all Masterbuilt electric smokers on our list. If you already have one of the Masterbuilt electric smokers, you may want to invest in this kit, too. Basically, it will make your current unit suitable for cold smoking aside from its traditional smoking capacity. Cold smoking is a process that yields nearly similar results as hot smoking but without the use of heat; it’s best used for smoking cheese, sausages, bacon, and fish. This is easy to use, too – just attach it to the loading port on the side of your current Masterbuilt digital smoker. When installed properly, it can generate flavored smoke up to 6 hours as well as generate heat in the 100° to 120°F range. Smokers by easily attaching to the wood chip loading port of the smoker. The Electric Cold Smoker provides continuous smoke for up to 6 hours at temperatures as lows as 100° to 120°F. The great thing about the Masterbuilt 20075315 electric smoker is its remote control although it isn’t the only great thing about it. You can set the time and temperature, as well as monitor and control them, without leaving your chair. You don’t even have to download any mobile apps since the remote control is ready to use as soon as you point it toward the smoker. The digital control panel can, of course, be used for setting the desired time and temperature, especially during the prepping time. But afterward, you will find it more practical to change and monitor the settings from the remote control. You can just relax or do whatever it is that you have to do in the meantime; in the first hour or so, you may have to add more wood chips but it’s definitely better in performance than a charcoal or propane smoker. There’s minor assembly involved but it’s a breeze, while the wheels make it possible to move the smoker on the smooth and flat ground. The racks can be removed and adjusted depending on the types and amount of food for smoking. These can also be easily cleaned with soap and water. The built-in meat thermometer is accurate so there’s little to worry about overcooking or undercooking the food. Again, you can check on the remote to determine the meat temperature. When you smoke meats and fishes, you will enjoy several benefits that come with such preparation. Smoked food can be healthier because there’s less use of added fat – the fat from the meat and fish are sufficient for the purpose – and there’s more use of herbs and spices to flavor them; less sugar and salt can be used. The fact that smoked food is also more flavorful than, say, fried food also has something to do with the popularity of the best electric smokers.